National right-wing media outlets The Daily Caller and Washington Free Beacon have together published two dozen articles criticizing Proposition 127, a clean energy ballot initiative in Arizona. Most of the pieces condemn the chief funder of the "yes" campaign, Tom Steyer, while failing to even mention the chief funder of the "no" campaign, the electric utility company Pinnacle West. Key figures in the opposition campaign have promoted the Daily Caller and Free Beacon articles on social media. The proposed constitutional amendment would mandate that electric utilities in Arizona generate 50 percent of their power from renewable sources by 2030. Nuclear power would not count toward the target, nor would hydropower generated from facilities built before 1997. The 50 percent target would be a sizeable increase over Arizona’s current renewable portfolio standard, which requires 15 percent of electricity to come from renewables by 2025. The utility industry has spent heavily to try to defeat Proposition 127. Arizonans for Affordable Electricity is the main PAC opposing the initiative -- and all of its funding comes from Pinnacle West, the parent company of Arizona Public Service (APS), the largest electric utility in Arizona. Pinnacle West has steered more than $30 million to the PAC. Other utility interests are fighting the initiative too. The parent company of Tucson Electric Power has spent $50,000 on its own effort to oppose Proposition 127, and rural electric cooperatives have spent $417,000 on their own campaign. The PAC promoting Proposition 127, Clean Energy for a Healthy Arizona, has raised less money, but still a substantial amount: $23.6 million. Nearly all of that has come from NextGen Climate Action, a PAC founded and supported by billionaire activist Tom Steyer. The League of Conservation Voters and Sierra Club have contributed some money as well. The fight over Proposition 127 has now become the most expensive ballot initiative battle in state history. Proposition 127 has generated a fair deal of media coverage at the national level. Both Bloomberg and The New Yorker recently reported in-depth on the ballot initiative fight, and The Atlantic included Proposition 127 in an article about out-of-state billionaires spending to support ballot initiatives. However, most of the national media attention has been coming from The Daily Caller and the Washington Free Beacon -- right-wing outlets based in Washington, D.C. 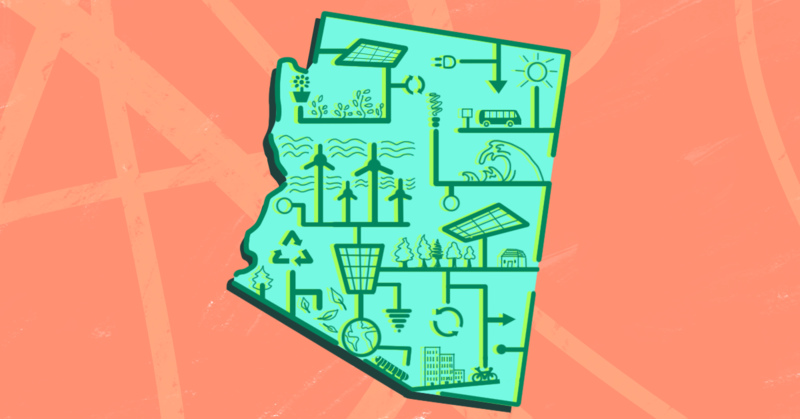 They have produced a steady stream of articles that are highly critical of the initiative, and often leave out key details regarding the funding and tactics of Arizonans for Affordable Electricity. Since March, these outlets have produced a combined 24 articles that criticized the ballot initiative -- 15 by The Daily Caller, nine by the Washington Free Beacon. Twenty-three of them made reference to Steyer in their headlines, and the only one that didn't still named Steyer in its first paragraph. But while the articles foregrounded the primary funder of the "yes" campaign, nearly all of them failed to mention that the main PAC behind the "no" campaign is being funded entirely by the parent company of APS. For example, a Daily Caller article from July was headlined “Tom Steyer One Step Closer to Dictating Arizona's Energy Industry.” It included a lengthy quote from Matthew Benson, spokesman for Arizonans for Affordable Electricity, but the story made no mention of the PAC's funding sources, and it failed to mention APS’ own near complete control of Arizona’s energy industry. Additionally, many of the articles painted Steyer as a carpetbagger from California aiming to interfere in Arizona’s affairs, but they failed to note that dozens of Arizona-based groups have endorsed Proposition 127. The campaign opposing the ballot initiative has seized on the articles in The Daily Caller and Washington Free Beacon and amplified them via social media. The official Twitter account of Arizonans for Affordable Energy sent at least three tweets that linked to articles in these outlets. A member of APS’ government affairs team tweeted out two of the articles -- one about Proposition 127, and another about a similar Steyer-backed initiative in Michigan. Vince Leach, a Republican state representative in Arizona, tweeted a Daily Caller article about how the initiative campaign is bankrolled by Steyer. Earlier this year, Leach worked with APS to draft a bill that would nullify the effects of the ballot initiative should it pass; the bill was signed into law in March. Leach has also received campaign contributions from APS as well as from Veridus, a PR and lobbying firm that is leading APS’ campaign against Proposition 127. The Washington Examiner, another conservative news publication based in Washington, D.C., also published an op-ed in September opposing the initiative. And the Heartland Institute, a fossil-fuel-funded climate-denial group, ran an anti-Proposition 127 blog post in September. A recent report by the Arizona Advocacy Network, a progressive organization that works on civic engagement and clean elections, outlined ways that APS and its parent company have used their massive financial power to sway legislators and regulators. "As of July 2018 Pinnacle West’s PAC donated $860,000 (2018 election cycle) to legislators and groups that are fighting clean energy in Arizona," the report notes. And in 2014 and 2016, Pinnacle West spent $7 million to elect friendly candidates to the Arizona Corporation Commission, which regulates utilities. APS is also reported to influence campaigns through the spending of dark money, which it doesn't have to report publicly. Proposition 127 is currently trailing in polls, so APS may get what it wants yet again. According to a poll conducted by Suffolk University in early October, nearly 47 percent of voters said they would vote no on Proposition 127, while less than 34 percent would vote yes. About one-fifth of voters were undecided. Ted MacDonald is a researcher with the climate and energy program at Media Matters, where he has worked since June 2018.